Maaii : Free 100 Minutes | Free Calls on iPhone | Maaii Rates | PC | Free Pc to Phone Calls, Free Voip Calls to India International ! In the past we have discussed about many cross or multi platform voip applications like Viber, Tango which allows free mobile calls. Today we will discuss about another such multi platform voip application : Maaii. Special thing about Maaii is that it is offering Free 100 Minutes Daily! Maaii is a multi-platform app for free calling and messaging. You can make free calls or send free chat messages to your maaii contacts and social network friends. Not only chat and text, it allows to make free calls daily. Yes, you can make Free Calls to India as well. Not only Maaii offers free minutes daily, the Maaii calling rates are also very cheap. 1. Mobile Number Registration : Register maaii with your mobile number. It's that simple. 2. All-in-one Communication : Stay connected to anyone at any time by calling or messaging with the ultimate app for iPhone and Android. 3. Integrated Contacts : Manage and sync your phone contacts and Facebook friends using a single app – super easy, super simple communications! 4. Call and Chat For Free : Make free calls and send instant messages to your maaii friends via 3G or WiFi. 5. Smart Keypad : Intelligent-dial keypad for easy contact search. 6. Offline Notifications : Never miss a call or chat message, even when the app offline. 7. Calls between maaii users are free. Best part about Maaii voip application for iPhone/iPad and Android devices : Maaii Free 100 Minutes Daily! 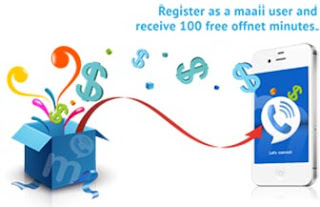 Registered users will receive 100 free minutes to call landline and mobile numbers in selected destinations. It is basically free credit worth $1.9. 1. Download and install Maaii on your iPhone. 2. Create an account with Maaii : it will ask for your phone number. Maaii will send SMS code to verify your mobile number. You will find that your account balance is $1.9,which allows you to make up to 100 free international calls to the world. Check this out : Free 100 International Minutes daily. For a limited time only, maaii will apply additional free credit to all user accounts that have credit balances less than US$1.90. The additional free credit allocations will recharge credit balances back to the original award amount of US$1.90. Account recharging will take place daily and shall end at maaii’s discretion with no notice to end users. All and any minutes given away as part of this Free Minutes Promotion will be forfeited (if not already used) 3 months after registration. Argentina (Buenos Aires), Australia (Adelaide, Brisbane, Canberra, Melbourne & Sydney), Belgium, Canada, Chile (Santiago), China, Croatia, France, Germany, Greece, Hong Kong, Hungary, India, Ireland, Israel, Italy, Luxembourg, Mexico (Mexico City), Netherlands, New Zealand, Norway, Puerto Rico, Russia (Moscow & St. Petersburg), Singapore, South Korea, Spain, Sweden, Switzerland, Taiwan, Thailand (Bongkok), United Kingdom, USA and Venezuela (Caracas); and mobiles located in China, Hong Kong, India, Puerto Rico and Singapore. Update 4th March : Maaii offer is still valid and can be used to make free calls on iPhone/iPod Touch/iPad : iOS Devices. A lot of people have asked us about Maaii for Android and Maaii for PC, however Maaii has not yet launched these apps. People are facing problems regarding less free minutes on Maaii : We have contacted Maaii about this issue (or their calling rates) and are awaiting response. We will soon update the Maaii response on this. Till then enjoy whatever the free minutes you are getting. Update 6th March : As one of our readers informed us, Maaii has updated its terms and conditions. Maaii has removed India from its Free Calling Destinations. I believe within no time Maaii got very popular and a lot of people started using it for calling India, so they have backed out India from free destinations. However as Maaii for Android is still in beta and not yet out, they soon have to bring back India in free destination list. They won't want loose Indian Android users! Free minutes can be used for calls to landlines located in Argentina (Buenos Aires), Australia, Austria, Belgium, Canada, Chile (Santiago), China, Denmark, Estonia, France, Germany, Greece, Hong Kong, Hungary, Ireland, Israel, Italy, Luxembourg, Malaysia, Mexico (Mexico City), Netherlands, New Zealand, Norway, Poland, Portugal, Puerto Rico, Russia (Moscow & St. Petersburg), Singapore, South Korea, Spain, Sweden, Switzerland, Taiwan, United Kingdom & USA and mobiles located in China, Guam, Hong Kong, Puerto Rico, Singapore and USA. Removal of India from free country lists means that the the call credit won't lasts for 100 minutes. However you can still call India but the call duration will be about 10 minutes. So still use Maaii to call India! Keep checking for latest updates or join us on Facebook/Google/Twitter! Update 17th March : Maaii for India is currently working and free credit worth $1.9 lasts for 8 minutes to India. How long does it take to get free credit? i signed up few hours ago and i still don't see any credits. I see the credit for 1.90, just wonder if they have removed the auto-recharge. Currently the amount get recharged to $1.90 but only 7min to INDIA not 100Min. I am also seeing the same thing.. I will contact Maaii about this and will update you. It used to be 100 minutes to India till about 2 weeks back, now it is 7 minutes. Yesterday it was 10. Do the call rates keep changing this often or is it a glitch in their software ? for other places beside India is it 7 mins.? It is not yet available for Symbian mobile We will update when it comes for symbian phones. Maaii for PC is currently not available in the market. However if you have iPhone/iPad/iPod Touch then enjoy free 100 minutes from Maaii daily. We are also noticing the same problem. The call duration has changed to 10 minutes. We have contacted Maaii about this. Lets see when there is any update. This seems to be some glitch or may be price hike (but why so much) ? Anyways 10 mins is better than not having anything..right ? One should keep using Maaii till then..
We have actually tried calling many destinations like USA, Sweden etc. Call duration is about 7-10 minutes, so it seems Maaii problem is not restricted to India! I got only 10 minutes. I was expecting 100 minutes. When will it launch the Maaii android app. We are waiting for it. MAAII has updated and they removed india from their 100 minutes program. India has been removed from the 36 countries list. Here rates of other countries are 1.9 cents only. I have tried calling USA and got 100 minutes only. I am not even able to call India (so minutes ain't concern now). Also we are not able to buy any credit, so again not able to call India. Please let me know if I am missing anything! Are you able to call India ? Well it seems that we are missing something. I am now able to call India (mobiles and landlines) however the free credit lasts for 8 minutes. Maii has again changed it's policy to credit 1.9$ on every Sunday instead of everyday. It's boring again.